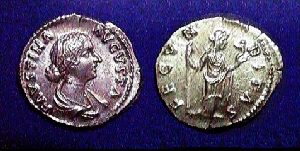 Annia Galeria Faustina Junior was the younger daughter of Antoninus Pius and Faustina Senior. 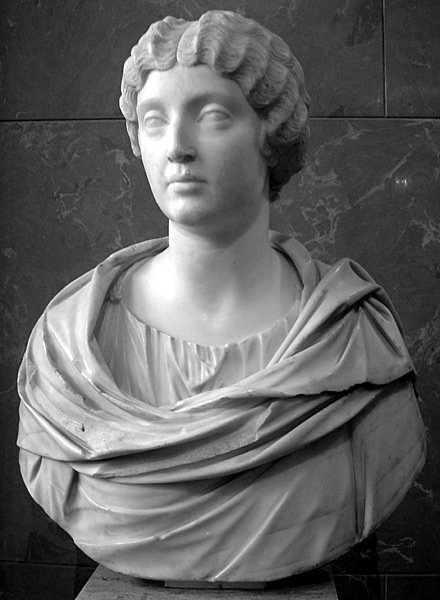 She was married to Marcus Aurelius in April-May of 145 AD when she was only 15 years old. She bore 14 children with Marcus but only 6 lived to adulthood of which 4 actually survived their father. 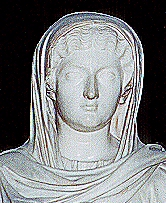 Faustina was given the title of Augusta on the birth of her first child in 146 AD. She gained quite a reputation for adultery reportedly taking many lovers including gladiators. As such, one rumor proposed that their son Commodus, who loved playing a gladiator, was in fact a child of one of her many affairs. Faustina did accompany her husband on his journey to the East in 175 AD and died at Halala, a village at the foot of the Taurus Mountains. Despite her reputation, Marcus appears to have loved her very much. He deified her and never married again. FAVSTINA AVG. PII AVG. PIL. FAVSTINAE AVG. PII AVG . FIL. 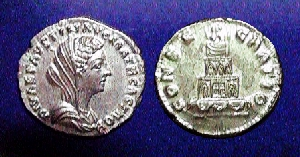 Commemorative coinage of Faustina Junior was quite extensive. Numerous issues were made with a host of styles and reverse themes.